If our eyes are the windows to our souls, then our laptops are the windows to our, well, who knows what. Our deepest fandoms? One man found this out when he purchased an old laptop for $5 and decided to fire it up. He discovered that it’s custom designed to look like the computer interface from Star Trek: The Next Generation. 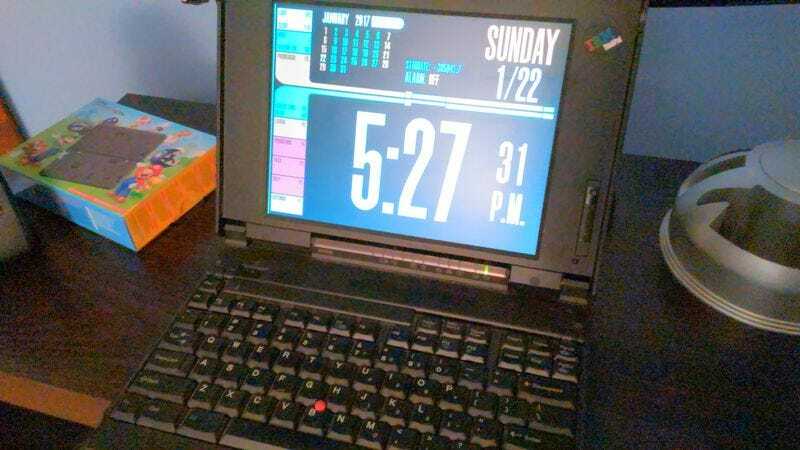 Imgur user chrisman01 shared his odd and unexpected journey with the quirky BM Thinkpad 365XD, which he didn’t even think would work when he bought it. The computer is installed with Windows 98, and the calendar is set to February 2008, which chrisman01 guesses is the last time the computer held a charge. It’s full of Star Trek wallpaper, Windows 98 and DOS Freeware, and a whole bunch of other oddities, including coordinates of the solar system, a map of the world, and a glossary of Australian slang. After eventually loading to a regular version of Windows 98, chrisman01 even found the old user’s AOL Messenger account with their info saved. Motherboard notes that the Star Trek-themed design isn’t quite as unique as it seems. It’s a LCARS24 GUI replacement, which can still be downloaded from SourceForge. So if you, too, want to pretend you’re Geordi La Forge each time you open your laptop, you don’t have to stumble upon a weird old computer to make it so.